Everyone’s favourite band of painfully British dweebs have come back together to celebrate 10 years since the hilarious comedy first aired. The Inbetweeners are back with a one-off special, Fwends Reunited, to celebrate the milestone. I clearly remember the show as a milestone in my childhood so the fact that was a decade ago makes me feel really old. 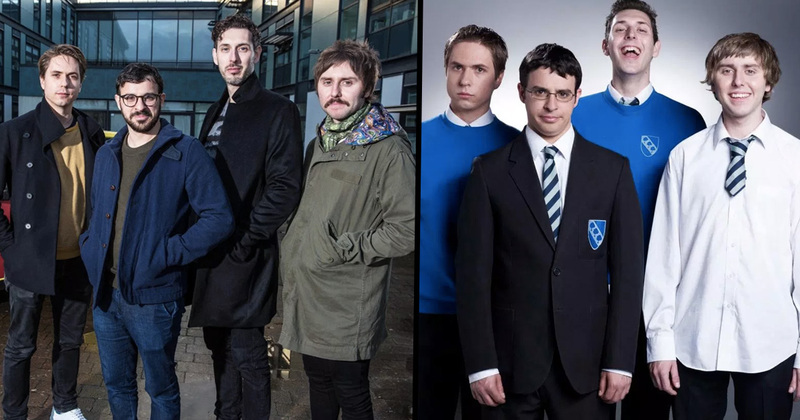 James Buckley, 31, Simon Bird, 34, Joe Thomas, 35, and Blake Harrison, 33, all have much more facial hair than they did in the original series…except the guy who played Simon actually, he still has a face like a baby’s bum. Not long ago James Buckley, who played the notoriously cringey Jay, posted a photo with on of the most iconic props from the hilarious show, Simon’s yellow (with a red door) Fiat Cinquecento. Luckily for us, it seems to have been resurrected and dried off ready for filming once again – though I think the poor car has seen enough pain already, what with Neil defiling the back seat and the unfortunate accident at Thorpe Park which resulted in its red door. I’m A Celebrity star Emily Atack, who played Charlotte Hinchcliffe, is also said to be joining the boys in their reunion. Buckley shared a picture of the reunion to his Instagram page, where he looks just as excited as fans are about the prospect of him being back with his friends (aw, fwends!). I bet Jay’s slept with thousands of women, all celebrities, and he’s no doubt also made his millions. Probably this generation’s Hugh Hefner, if his previous stories about himself are anything to go by! Can’t wait to see our boys back on the screen.